This Member Update was provided by Dale Askey, Administrative Director for the Lewis & Ruth Sherman Centre for Digital Scholarship, and Associate University Librarian, Library and Learning Technologies, McMaster University. McMaster University is a public research-intensive institution located in Hamilton, Ontario, enrolling nearly 26,000 students across its comprehensive curriculum. The McMaster University Library consists of three physical locations and is a member of the Association of Research Libraries. We are fortunate as a library to run our own data centre. This independence from campus IT enables a high degree of flexibility and agility, and distinctly influences our software and project selections. We employ a number of innovative technologies in our server stack, such as an Infiniband network to allow rapid data transfer between server nodes and to assist with disaster recovery. We also tend to eschew vendor solutions in our software and hardware stacks. For example, we use KVM virtualization rather than VMware or similar solutions, and open source Backblaze pods (massive arrays of consumer disks) to provide mass storage for library projects and researchers rather than costly SAN or storage appliance options. As with most libraries of our size and type, we support a wide range of applications at campus scale: an integrated library system, VuFind, Islandora, EZproxy, Open Journal Systems, and DSpace. We also support multiple instances of two content management systems—Drupal and WordPress—upon which most of our public-facing and internal content resides. Beyond these core systems, we support literally dozens of smaller applications that tend to portions of our business. We are fortunate to have two entities as part of the University Library that clearly establish us as a progressive organization on campus and in the region, namely the Lyons New Media Centre and the Lewis & Ruth Sherman Centre for Digital Scholarship, both located in Mills Memorial library, our main location. The former is an attractive and inviting space that includes state-of-the-art desktop hardware loaded with the Adobe Creative Suite and other critical media software. 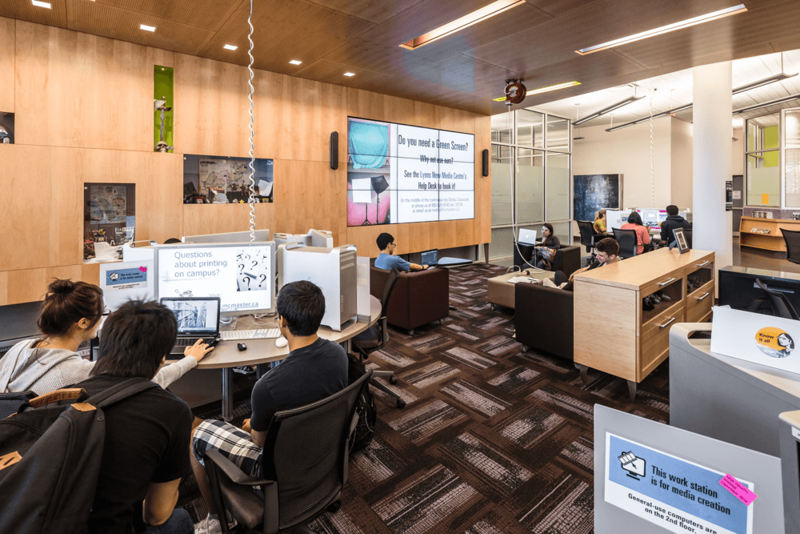 There are also editing suites, a green screen video production studio, a large video wall for displaying student work, a gaming suite, a public-access 3D printer, and expert media consulting and advice. Since opening in 2010, Lyons has become known as the place to go on campus for students interested in media production. The Sherman Centre for Digital Scholarship was established in 2012 and is an official McMaster research centre. It supports a diverse array of faculty and graduate student projects in and around the digital humanities, provides infrastructure and advice for myriad digitization, archival, and publishing projects, and works with faculty to develop both official and ad hoc curriculum to ensure that students receive exposure and training in the tools and techniques of digital scholarship. Recent classes have included introductions to the Arduino computing platform, command line computing, and the launch of our Demystifying Digital Scholarship workshops, a six-unit series intended to do what the name promises for those interested but as yet inexperienced. In the upcoming semester, we launch the first iteration of a three-credit digital humanities course targeted at humanities undergraduates. It focuses on using a variety of DH techniques to tell more nuanced and visually compelling stories about WWI, leveraging our extensive and unique manuscript and map collections. The curriculum development is led and energized by a postdoctoral fellow who recently joined us from the University of Washington. The staff complement we have working intensively with technology is fairly typical of what one finds in similarly sized libraries, with a few local twists. We have a trio of “digital” librarians—Digital Scholarship Librarian, Digital Repository Librarian, Digital Experience Librarian—and a strong team of programmers, systems administrators, and desktop support staff. One of our unique features is what the Digital Scholarship Librarian refers to as “research IT,” where we have a set of servers set aside for more experimental work, well quarantined from our general public-facing services. The aforementioned Backblaze-pod powered storage array—315TB (raw) across two pods located outside of our main data centre—is an example of this type of work, although as it matures it tends to find applications across the organization, which is the fortuitious cycle one would hope to initiate by having such flexible research practices. We also have a makerspace where we explicitly encourage staff to explore ways to build useful systems—e.g., access control systems or temperature sensors—from low-cost devices such as Raspberry Pi computers or Arduino microcontrollers, which yields interesting and useful results as well as builds staff confidence and skills. We have taken steps to move away from vendor solutions so that we can offer more emergent features and functionality to our users. This past summer, we migrated our institutional repository and journal publication platform from bepress to DSpace and OJS, respectively, a move that enables us to add value to these services in the future. We are also marked by a distinct agnosticism with regard to declaring software standards, whether with regard to productivity applications or operating systems. While the majority of our staff use Windows-based machines for their core work, we have many individuals using a wide range of technologies for their work, including Chromebooks, iOS/Android devices, and machines based on Linux or OS X. While this Babel-esque environment does create some integration and support problems, it both situates us well for the emerging “Internet of things”/ BYOD future and grants our staff a high degree of flexibility when configuring their optimal technology setup. Given the low cost of many aspects of technology—from storage to displays—we find it wiser to adopt a “why not” approach to requests for technology (within sensible limits, naturally), rather than subjecting staff to inquisitorial justification procedures. When a 4TB drive can be had for under $150, talking about how much storage someone needs in their computing costs more than buying it. An area where we have a lot of ideas but also a lot of work to do is spreading our technology ethos to the broader organization. In some areas, this is happening already, such as with our Maps/Data/ GIS department, which collaborates across departmental lines with various IT staff to achieve its goals and transform itself from a map-centred unit to one that digitizes and georectifies maps and supports emerging research data management needs. In other areas, such as Archives and Research Collections, we have strong ambitions to get started with Archivematica and/or other similar tools, but have as yet to move forward with these ideas. In general, we struggle a bit, as do many libraries, with negotiating the transition between the library that was and the library that will be, while trying to serve users who expect us to be both at once.